Delhi is a very interesting city to be in and is way too different from any other metro city in the country. On one hand, you will find extreme modernity, and on the other, it is still grounded in its traditions. On one hand, you will find concrete jungle, but to a treat to your eyes, you will find relatively more greenery too. On one hand, you will find some of the world’s biggest fashion brands being promoted here, on the other, you will find enough likelihood for local handicraft too. On one hand, you will find the swankiest buildings, and on the other, you will find historical monuments that are architectural marvels. If you want to feel all of this essence of Delhi in one, visit Hauz Khas. Also known as Hauz Khas Village, this is a very distinct village, from the ones you may have visited earlier. Extremely popular from the medieval times, Hauz Khas Village is an affluent neighborhood of South Delhi and is a hot spot amongst the city residents. Hauz Khas is one of the hottest hangout places for the youth of the city due to its hep restaurants and discotheques. It is also visited a lot by the foreign tourists touring the city, as it houses a lot of handicraft shops. Hauz Khas is named after the water reservoir, which is a part of the Hauz Khas complex. 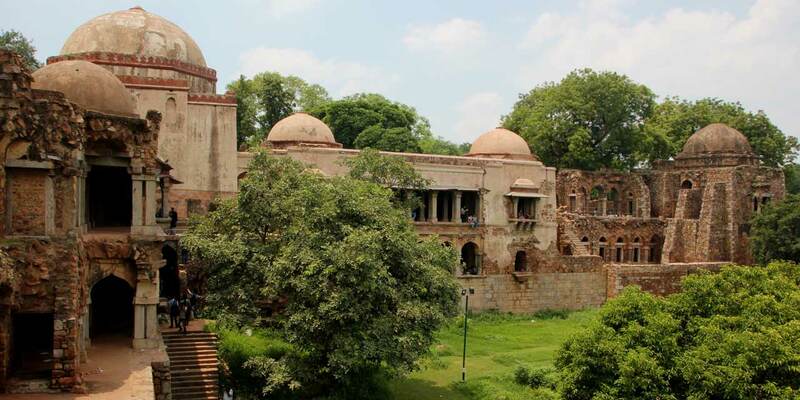 Hauz Khas is an Urdu term, which means a water tank for the royal. The water reservoir was built was Alauddin Khilji in the period between 1296-1316, to meet the water needs of the inhabitants of Siri Fort. The Khilji Dynasty had a greater role to play in the development of the area. Besides the Hauz Khas Lake, it also has a mosque, called Neeli Masjid and a tomb, that have been built during the reign of the Khiljis. The famous Chor Minar gives a sense of how Khiljis used to rule. All the thieves in those days used to be put to display on the Chor Minar, which is situated within the colony. The very famous Hauz Khas Complex is the place to reach out to if you are interested in the history of the place. The place is adorned with domed structures, which are the tombs of the royal personalities that reigned the place between 14th to 16th century. Amongst all of these, the tomb of Firoz Shah Tughlaq, a ruler of Tughlaq dynasty, is a major attraction. It is situated towards the end of the complex. If you are already charmed by the history of the place, hold your breathe, there’s much more coming your way, while you are in Hauz Khas. The Hauz Khas village, that surrounds the Hauz Khas Complex was developed much before South Delhi started becoming what it is today. Deer Park: Also known as A N Jha Deer Park, Hauz Khas’ Deer park is one of the major attraction amongst those looking for a breather from the regular hustle-bustle of the city. It is named after the famous social worker Aditya Nath Jha and is famous amongst the residents for daily morning walks, jogging sessions and weekend outings. The serenity of the place is beyond description. The place serves as a picnic spot for schools and families. The Deer Park is divided into several sub-sections, that include the Rose garden, Fountain and district park, Duck Park, Rabbit Enclosures, etc. It also has some tombs, that come from the Mughal Era. It is called Deer Park as it has a large number of deers inside the park. The deers have enough space to roam around, play with each other and they provide learning and entertaining experience to the visitors, especially the children. The Hauz Khas Jheel, located inside the Deer park enhances the picnic experience manifolds. There’s a restaurant within the park campus, called Park Baluchi, which offers amazing dining experience to the people, looking to spend some quality time in Deer Park. The park opens everyday from 5 AM to 8 PM during summers and 5.30 AM to 7 PM during winters. Art Galleries: Hauz Khas is a place for one and all. It is probably the only area in Delhi city that attracts the most diversified crowd, including artistes. There are a host of art galleries in the Hauz Khas Village area. Delhi Art Gallery is one of the most popular and established art galleries in Hauz Khas village. It holds new exhibits every month and deals only in masters. Also known as DAG, the art gallery gained its real momentum in 2011, when it reopened with over 250 art pieces by six of country’s most renowned artistes including, MF Hussain, SH Raza and FN Souza. There’s a library at the second floor of the building. However, it is not accessible for everyone. Impulse Art is another gallery that is worth a visit, mainly for two reasons. The art pieces available in this basement gallery are pretty affordable and also, you get to meet the artist who sits at the counter. You can find art pieces for as low as Rs 80 in this art gallery. So, make sure you visit this to add some art to your life. The Village Gallery, Art View, Rang Art Gallery, GNR Art Gallery, Arjun’s, Green House, Hot Off The Canvas are a few more places to check out for those who have a piece of art in their hearts. Hauz Khas Social: Yes, there are many Socials around the country, but this one is certainly different. This three-storeyed cafe is so impressive that it mesmerised iconic filmmaker Imtiaz Ali too. He used the place to film a scene in Ranbir Kapoor-Deepika Padukone starrer Tamasha. However, its food is no less either. From Asian, to Italian, North Indian and Continental cuisines, Hauz Khas Social offers a great variety of food. Try the Mezze Platter, Shawarma Platter, China Box and Chilly Hot Wings of this restaurant to actually understand why we are praising the place so much! Coast Cafe: Yes, there is no coast close by, but you can get some amazing coastal food in Coast Cafe of Hauz Khas Village. From slurpy Kokum Fish Curries to avials, thorans to moilees, you will be served with everything awesome in this lake-side restaurant. Yeti- The Himalayan Kitchen: Do you have an inherent love for hills? Well, we can’t bring you hills in Delhi, but we can certainly get the flavour from hills for you. Yeti: The Himalayan Kitchen brings the best of Nepalese and Tibetian food for you, right in the heart of Delhi city. Sekuwa (chargrilled mutton pieces), Nepalese thali, Yeti veg platter and Macha tereko (fish marinated with spices and batter fried in mustard oil) are some of the dishes worth trying while you are visiting the place. Elma's Bakery, Bar and Kitchen: Not just the amazing food, the inviting ambience of the cafe is sure to leave you mesmerised. The beautiful decorations of artful lamps, fairy lights, wall hangings and vibrant walls make Elma’s Bakery Bar and Kitchen a place worth spending time. Of course, the food complements the entire experience. The freshly baked bakery, snacks and chocolates of the place are sure to leave you longing for more. However, don’t forget to try Tiramisu, Risotto, the Mezze Platter, Banana Pancakes, Blueberry Cheesecake, Banoffee Pie and Pasta in this fancy restaurant. Pubs and Discotheques:Nightlife in Hauz Khas Village could be a once-in-a-lifetime experience. The places are not just exotic in terms of the experience they offer, safety in these discs is also well taken care of. A lot of the pubs and discotheques in Hauz Khas Village give exclusive offers to their women customers. For example: Fork You. This club is known for iys music, Ladies Nights, drinks and burgers. Tuesdays in Fork you are all about ladies, retro classics, and free cocktails in customised glasses. Raasta is quite popular amongst the youngsters visiting Hauz Khas Village. DJ Paddy’s rock and retro is not the only the only reason you should visit the place. Ladies are served with free drinks till 11 PM in this bar and disc. Levels HKV: The spacious rooftop is known for its amazing drinks and music. Thursdays in Levels HKV means free drinks and on-demand music for ladies, all under the serene moonlit atmosphere. Bulldogs, Maquina, Miabella, Out Of the Box, Moonshine, The Pink Room and Bootlegger are a few other names that you must know if you are willing to check out the nightlife at hauz Khas Village. Designer boutiques:Hauz Khas Village is known for being a hub of designer stuff. From clothes to jewelry to shoes and bags, you get anything and everything designer in this place. Hauz Khas Village came on the map of designers after the renowned designer Bina Ramani opened her outlet. There was no looking back after that. Besides the fashion boutiques from Ricco, Rishika Khera Designs, Nitin Bal Chauhan, The Grey Garden, Richa Chaudhary, Dozakh, Ish Om, the place has some amazing concept stores as well, like House of Blondie. This amazing vintage store sells some different stuff in categories like kitsch blouses, jewelry and sunglasses. The over-sized bulbs placed in the store add to its theme and drama. Nappa Dori is another unique store that sells handmade leather accessories for men. A lot of the stuff from this boutique is also exported to places like London. Bodice is yet another place to check out if you are looking for something unusual. Owner Ruchika Sachdeva offers stuff in unconventional cuts, with rather traditional block printing, that impresses people with a different fashion sense. Hauz Khas Village is a place where not only established names, but budding designers can be found. While you may choose to stick to a name that has made its mark, don’t forget to check-out some of that budding talent in the by-lanes and basements of this village, who could be the next big name of the fashion world. Not only will you get something innovative, you will also get your stuff decently priced, if the designer is not so well-known. So, the call is yours. The Hauz Khas Village complex is open from Monday to Saturday from 10:30 AM to 7:00 PM and remains closed on Sundays. However, the restaurants within the complex remain open daily till 11 PM. There is no entry fee to visit the complex. Metro: Hauz Khas has its own metro station called Hauz Khas Metro station. You can take an auto or a rickshaw to move further into the Hauz Khas Village after getting down from the metro. Bus: DTC buses number 405A, ML-79, ML-87, ML-77, ML-73, 534A, 534, 511A, 894, and 578 pass through Hauz Khas area. Auto/Cab/Taxi: Delhi is very well connected when it comes to autorickshaws, cabs or taxis. You can order these vehicles by apps like Ola, Uber or Jugnoo or catch them on road too. Don’t forget to carry your camera when you visit Hauz Khas Village. The place has amazing scenic beauty that is worth capturing. Do keep some time in hand when you plan to visit the place extensively. There’s a lot to explore in Hauz Khas Village. Do keep your wallets full when you plan a trip to this designer destination. You may not be able to resist the shopping opportunities of some amazing designer stuff you get in the Hauz Khas Village.